This salad brings back every memory of going to my Nana’s house for a special dinner. Most occasions, whether having friends in town from college or celebrating Valentine’s Day in middle school bring back a memory of this salad. It’s the perfect savory dinner salad; filling with meaty hearts of palm, crunchy with fresh red onion and cherry tomatoes, and creamy with green avocado. I substituted arugula for a peppery addition, but she always makes it with romaine. The dressing is homemade and a keeper for anyone’s recipe box. I added the cumin to the recipe, you can try it both ways and see which you like better. It goes well with nearly any savory salad (and makes a great alternative to Caesar), but can also be used to marinate chicken or drizzled over grilled vegetables. I hope it becomes incorporated into your family’s repertoire as it has in mine. To make the dressing, combine all of the ingredients except for the olive oil. Whisk well to combine and break down the sugar. Whisk while drizzling in the olive oil to make an emulsion. Season to taste with salt and pepper. Set aside. Slice all of the vegetables, including the hearts of palm into bite-sized disks. Toss all of the salad ingredients together and gently fold in the dressing. Serve and finish with freshly cracked pepper. 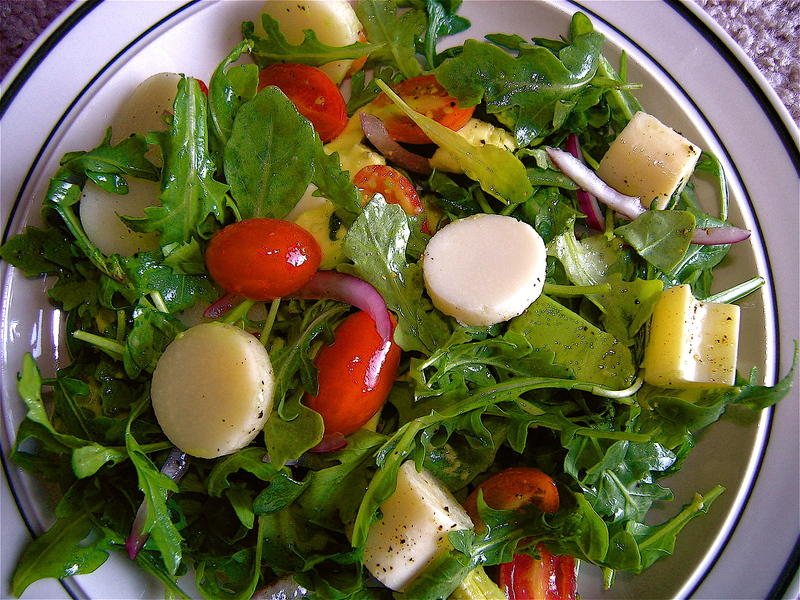 *Note: The picture for this dish is the salad tossed with the dressing without the parmesan cheese. The parmesan would turn everything slightly white and would not convey the absolute deliciousness every bite contains. Follow the directions do not follow the picture!